The second country workshop happened in Tirana, Albania on June 26, 2018. 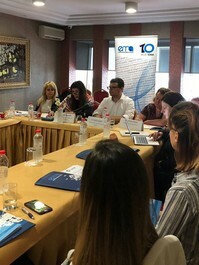 The workshop organized by the local partner, European Movement – Albania (EMA) with the support of the European Centre, brought together representatives from the Directorate for Employment and Vocational Trainings, Ministry of Economy and Finance, Labour Inspectorate, social partners, and researchers to discuss the transposition of the Posting of Workers Directive in Albania and the institutional capacities for implementing the Directive once Albania becomes a member state. 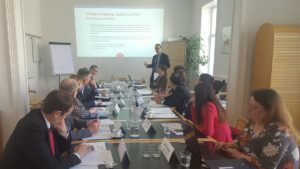 The European Centre organised the first ‘Bridge Building in Social Welfare Policy’ Workshop with the European Centre’s National Liaison Officials (NLOs) in Vienna, on 19-20 April 2018. NLOs and representatives from the Western Balkans and Eastern Partnership countries, Board Members, and officials from the Austrian Federal Ministry of Labour, Social Affairs, Health and Consumer Protection, met to exchange experiences regarding the implementation of transnational projects. They also discussed project ideas and explored different cooperation and funding opportunities. This was the first of meeting of the European Centre’s NLOs and an important step towards deepened cooperation with the region. The Posting of Workers in Eastern Europe (EEPOW) Project had its Kick-Off event in Vienna, Austria on the 27 and 28 February 2018. 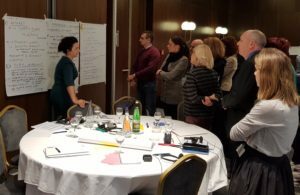 The project brought together eight partners and three associated partners, four from EU member states (Austria, Germany, Italy, Slovenia) and four candidate countries from the Western Balkans (Albania, FYROM, Montenegro, Serbia). The project aims to proactively address the issue of posting of workers at its pre-accession stage by assisting the participating candidate countries in assessing their needs on the implementation of the Posting of Workers Directive and building their capacities for the implementation of the Directive when it becomes applicable. It does so through various activities on mutual learning, information exchange, cooperation and research among the partner organizations and the targeted national and transnational stakeholders. The Kick-Off was followed by the first Steering Group Meeting of the Project. It enabled national policymakers to collectively think and envisage macro (policy), meso (organizational) and micro (beneficiary) level implications of potential case management practices in their own countries. It stimulated practical ideas concerning partnership modalities that will ensure effective and efficient implementation of case management and of local inclusive labour markets vision at large. It ensured convergence towards EU and global good practice enhanced through peer learning and support. It instigated cross-country policy dialogue to help innovate applications to tackle the employment of vulnerable groups and foster inclusive labour markets. Eleven participants from Albania, Armenia, Azerbaijan, Bosnia and Herzegovina, Georgia, Macedonia, Moldova, Montenegro, Serbia and Ukraine successfully completed the Bridge Building Summer School on social selfare (BB Summer School) at the European Centre for Social Welfare Policy and Research, in Vienna, Austria, from 10 to 14 July 2017. Researchers, practitioners and CSO representatives gathered to foster channels of learning, communication, and partnerships. The main outcomes of the BB Summer School include: the learning of best practices, the exchange of knowledge and experiences, the development of collaborative work, and the strengthening of the Eastern European Social Policy Network (EESPN). 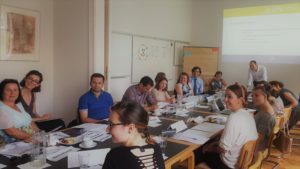 The summer school’s key event, the EESPN public forum, was hosted by the Austrian Federal Ministry of Labour, Social Affairs and Consumer Protection. Together with approximately 45 people, the key note speakers Dr. Cartwright and Ms Marić approached the question of ‘Divided society – Cohesive Europe?’. The summer school is co-funded by the Central European Initiative. The European Centre together with the CEI-Central European Initiative implemented the ‘Bridge Building Summer School on Social Welfare‘ to buil capacities and overcome societal challenges from January until August 2017. The European Centre organised the Launch event “Building Bridges in Social Welfare Policy in Eastern Europe” that took place on 19 September 2016 in Vienna. It aimed at exchanging expertise from researchers, policy makers and practitioners on Albania, Armenia, Azerbaijan, Bosnia and Herzegovina, Georgia, Kosovo, Macedonia*, Moldova**, Montenegro, Serbia, Turkey, and Ukraine. 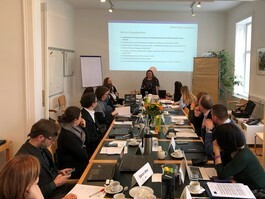 Scholars and experts with expertise in innovative approaches in labour market policy, health and social care (long-term care) arrangements in the above-mentioned countries discussed recent research findings and good practice implementation. As a result of the event, the Eastern European Social Policy Network, in short EESPN, was launched gathering researchers, civil servants of respective ministries and other public authorities as well as civil society organisations to intensify exchange and mutual learning in social policies. For more information see following link.